Yes, my friends, BendixKing is still around. We are all used to the latest and greatest Garmin products these days. Don’t get me wrong, Garmin and Aspen make great retro-fit products for your instrument panel, while Garmin and Avidyne are at the top of the touch-screen GPS market, but don’t forget about BendixKing. They are staying in the game too. BendixKing announced in April the xVue Touch for experimental aircraft, with the STC for the AeroVue Touch for certified aircraft coming later this summer. The xVue and AeroVue touch are pretty nifty units, comparable in features to what Garmin is doing with the G500 TXi and G600 TXi. It will be difficult to claw back into a competitive market share with Garmin, but BendixKing might find a niche market of followers. Let’s take a look at the unit. Now, I have not used the BendixKing AeroVue Touch or the xVue Touch, only read about them. But, what I’ve read sounds pretty cool. The display has really good resolution (BendixKing brags it is the highest screen resolution available), synthetic vision that comes standard (Garmin & Aspen charge extra for synthetic vision), plus VFR Sectional Charts & IFR High and Low Enroute charts, making paper charts even more obsolete. The display is 10.1 inches and can be easily swapped between a full screen instrument mode or a split screen setup as seen above. Apparently, BendixKing has 3-D moving maps available on the AeroVue Touch too, which is standard. The one thing Garmin has on the BendixKing AeroVue Touch right now is engine information. The G500TXi has a full complement of engine gauges available; the AeroVue Touch doesn’t, yet. BendixKing says it’s in the works, as well as radio information and autopilot control. I’m assuming the future autopilot control software would mean you could remotely mount an autopilot controller and input all functions from the AeroVue Touch display. The nice thing about these future upgrades is all the software updates are free through BendixKing. The sticker price for the forthcoming unit is going to be about $12,600. Garmin’s 10.5 inch G500 TXi is $16,000, while Aspen doesn’t offer anything quite that big. 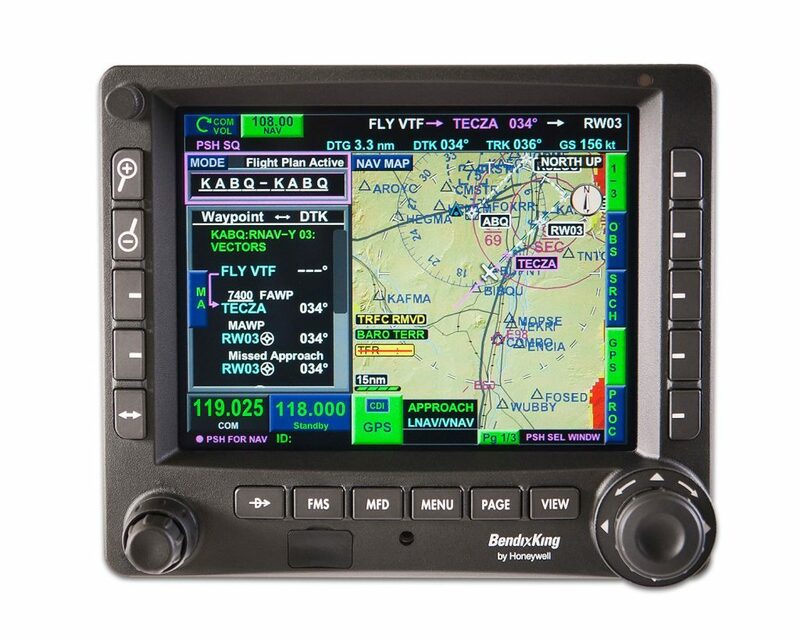 I’ve been keeping my eye on the BendixKing KSN 770 Touchscreen WAAS GPS for a few years now. It never really has caught on quite like the Garmin GTN 750 or the Avidyne IFD 540. BendixKing took the same route that Avidyne did in creating a hybrid touch GPS (or mini-MFD if you want to look at it that way) where a pilot can perform functions either using the touch screen or utilizing soft keys on the edges. I like the hybrid touch approach as I have been bounced around in turbulence while trying to tap something into a Garmin GTN 750 and it can prove difficult. Similar to the AeroVue Touch, BendixKing utilized split screen technology in the KSN 770. It’s a full WAAS unit that is already certified. It’s sticker price is $14,200, compared to the Garmin GTN 750 at $17,200 and the Avidyne IFD 540 at $15,000. KFC 230 AeroCruz Touchscreen Digital Autopilot-2 or 3 axis options. Will be the only touchscreen digital autopilot available on the market. Also able to utilize the servos from older KFC autopilots. Should be available late fall or winter ’18.